Exclusive Europe Summer Tour 2013.. Welcome to London charming city with a royal heritage, incredible wealth of history,culture and exciting attractions. There is no better place than London to begin this grand tour. Check in to the hotel and relax for some time.Enjoy a comfortable overnight stay at the hotel in London. After breakfast, embark on a guided city tour of London, which includes sights such as Buckingham Palace, Piccadilly Circus, Regent Street, Oxford Street, Marble Arch, Hyde Park, Regent Park, Trafalgar Square, The Strand, The Big Ben, The Houses of Parliament, Westminster Abbey, London Eye, Tower of London, Tower Bridge, St. Paul’s Cathedral, White Hall and 10 Downing Street (the Prime Minister’s residence). Thereafter, move on to enjoy a ride atop the famous London Eye, situated in the heart of London, from where you can get amazing panoramic views of the city and of Westminster Bridge, Victoria Embankment, Saatchi Gallery and County Hall. In the evening, board an overnight cruise headed to the shores of Netherlands, a unique cruising experience that you won’t forget. After breakfast,proceed to Amsterdam tour, the financial and cultural capital of the Netherlands. The best way to experience Amsterdam is on a traditional canal cruise.After the cruise, visit one of the most famous wooden shoe factories of Holland and witness a demonstration of the history, traditions and the making of authentic Dutch wooden shoes. After the demonstration, take a photo stop at a windmill, one of the most distinctive sights of the Netherlands.Later, visit Madurodam, which is a beautiful miniature model of a typical Dutch town, downsized in the ratio of 1:25. It also contains many famous miniature landmarks, which are absolute copies of the real ones. Enjoy a comfortable overnight stay at the hotel. After a scrumptious breakfast, embark on an orientation tour of Brussels – capital of the European Union, and visit Grand Place and its famous guild houses, City Museum, Town Hall, House of the Dukes of Brabant, Manneken Pis, Royal Palace, Royal Park, Palace of Justice and the Museum of Fine Arts. Thereafter, enjoy a photo stop at the Atomium, which was built for the 1958 World Fair. Later, proceed to Paris and begin your orientation tour covering Arc De Triomphe, Champs Elysees, Grand Palais, Petit Palais, National Assembly, Alexander Bridge, Concorde Square, Magdalene Church, Opera Garnier, Louvre Palace, Cite Island, French Academy, Sorbonne University, Orsay Museum, Church of the Invalides, Military Academy, Trocadero Square and the Palais De Chaillot. After checking in to the hotel, enjoy your time at leisure OR embark on an optional tour which is the best way to experience the glamour and lights of Paris.Return to the hotel after the tour for a comfortable overnight stay. After a delectable breakfast, proceed for a cruise on the River Seine, which is an excellent and unique way to see Paris and sail past many of its historical monuments. After the River Seine cruise experience, enjoy your time at leisure OR join us for an adventurous and funfilled time at Disneyland Paris, where many thrilling rides and fascinating shows await you. Meet your favourite cartoon characters and enjoy the jovial atmosphere with your whole family.Later, return to the hotel for a comfortable overnight stay. After breakfast today, we proceed to the scenic Black Forest in the southwest region of Germany. lack Forest to witness how the famous and original Cuckoo Clocks of Hofgut Sternen are made. Enjoy a comfortable overnight stay at the hotel. After a scrumptious breakfast, we proceed to Innsbruck, which is the capital of Tyrol. The alpine scenery of Innsbruck, together with its charming meadows, set against snowy peaks is a sight to behold. Nestled amidst snow-capped mountains, the city of Innsbruck is spread out along the banks of the River Inn. Upon arrival, proceed on an orientation tour of Innsbruck covering Goldenes Dachl – Golden Roof, Hofburg, Hofkirsche, St. Anne’s Column, Stadtturm, Triumphpforte, and Helblinghaus. Thereafter, proceed to the world-famous Swarovski Crystal Showroom to take a look at the amazing collection of precision-cut lead crystal glass and other related products. Admire and shop to your heart’s delight, amongst the largest exhibits of the Swarovski Crystal collection. After a hearty breakfast, proceed to Maranello to visit the Ferrari Gallery. This two-storey museum exhibits a bevy of racing cars that were driven by great Ferrari drivers such as Gilles Villeneuve, Froilan Gonzales, Rubens Barrichello and Michael Schumacher, among many others. Hereafter, drive on towards the eternal city of Rome, which has been a site of major historic events and has also been the cultural centre of Europe for more than one and a half millennia. Check in to the hotel in the evening for a comfortable overnight stay. After a hearty breakfast, proceed to Maranello to visit the Ferrari Gallery. This two-storey museum exhibits a bevy of racing cars that were driven by great Ferrari drivers such as Gilles Villeneuve, Froilan Gonzales, Rubens Barrichello and Michael Schumacher, among many others.Hereafter, drive on towards the eternal city of Rome, which has been a site of major historic events and has also been the cultural centre of Europe for more than one and a half millennia. Check in to the hotel in the evening for a comfortable overnight stay. After breakfast, embark on a guided city tour of Rome and witness sights such as the Colosseum, Arc of Constantine, Roman Forum and Caesar’s Forum. Drive past the Venice Square to experience the stark contrast between the architecture of the traditional Palazzio Venezia and the modern Victor Emmanuel Monument. Later, visit the Trevi Fountain, which is considered to be the most beautiful fountain of Rome (legend has it that if you make a wish and throw a coin in, your wish will come true and you will return to Rome). 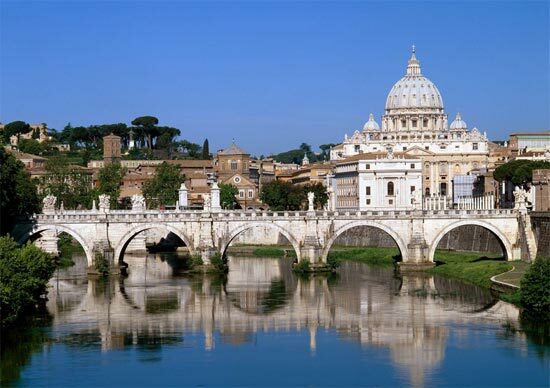 Thereafter, drive past Palatino Hill to witness the beautiful church of Santa Maria Maggiore.After the incredible Rome experience, visit Vatican City, which is also the smallest country in the world. Enjoy a comfortable overnight stay at the hotel. After enjoying breakfast, embark on a walking tour of Florence, visiting sights such as, the Cathedral of Santa Maria del Fiore, Campanile and Baptistery. Enjoy some free time in Piazza Della Signoria to view Palazzio Vecchio, the Loggia Dei Lanzi and the Fountain of Neptune. Later, we visit the historic city of Pisa, famous for its architectural beauty. Upon arrival, visit the Campo Dei Miracoli and enjoy stunning views of the Leaning Tower of Pisa, the Cathedral and the Baptistery of Pisa.Later, enjoy a comfortable overnight stay at the hotel. After breakfast, proceed to Milan for an orientation tour with the breathtaking Duomo and its magnificent square, the Scala Museum and Theatre, and Galleria Vittorio Emanuele, which is a double arcade in the center of Milan, Italy. Enjoy a comfortable overnight stay at the hotel. After breakfast today, enjoy the day at leisure in the serene and soothing environs of Switzerland OR make use of the free time to embark on an optional tour to visit Jungfraujoch, often referred to as the Top of Europe. Also, visit the charming town of Interlaken. Later on, drive to Interlaken, which is a world famous Swiss town located in the Bernese Oberland mountains between the lakes of Thun and Brienz. Finally, return to the hotel for a comfortable overnight stay. After a scrumptious breakfast, begin your adventurous journey to Mt. Titlis. On an unforgettable 45 minutes’ long ride to the top, switching three different cable cars, you will be mesmerised. Along the way, you will witness the scenery changing from green meadows and scenic lakes to snow clad mountains.After the great Mt. Titlis experience, proceed to take an orientation tour of Lucerne, which is a beautiful city located at the northern tip of Lake Lucerne. Later, we proceed to Zurich. Begin your orientation tour, covering Bahnhofstrasse, Gross Munster, Frau Munster, Rathaus and St. Peter’s Church. Enjoy a comfortable overnight stay at the hotel. After a hearty breakfast, it is time to bid good bye to Europe as we receive a transfer to the airport in time to board the flight back home. With an enriching experience, we leave with new friends and happy memories of one of the most beautiful continents on earth. Departure flight from Delhi to London.Arrival flight from Zurich to Delhi. If you have not decided yet or wants to customize tour itinerary or hotels listed above in "Grand Deal Of Europe Summer 2013 from makemytrip", then we can change the travel itinerary and make a personalized, tailor-made holiday package, especially for you. We can modify this travel package as per your itinerary, budget, duration and the tourist places you would like to visit, including transportation and airfare should be included or not. Please fill the form below to contact us.